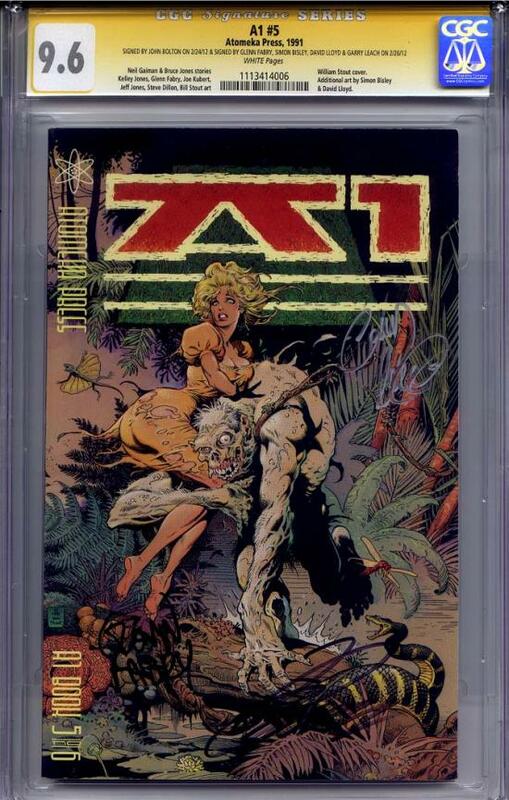 A1 #5 CGC 9.6 Signature Series signed by artists GARRY LEACH, GLENN FABRY and DAVID LLOYD. Published by Atomeka Press in 1990, this anthology series from UK creators remains a very hard set of books to findn in high grade. Pictured here is the only graded (let alone signature series) copy of this book ever graded for signature series. Unread file copy. Contributors GARRY LEACH and Glenn Fabry are hard to get---this was Leach's first ever signing and Fabry rarely does the convention circuit any loner. For those unfamiliar with Garry Leach, he was the UK artist responsible for the early Miracleman comics with co-creator Alan Moore. Only 17 comics signed for s/s, these remain the only Leach s/s comics, of which almost none have gone to public sale.